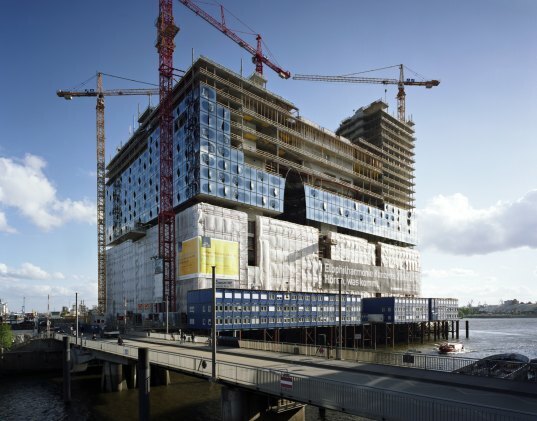 Today in Hamburg the “topping-out” celebrations began for the city’s new cultural landmark on the Elbe River. Elbphilharmonie started construction a year and a half ago and is now reaching completion. The fantastical concert hall adds more than just an auditorium to the city, as the mixed-use complex also includes a hotel, restaurants, a conference center, condos, a public plaza, and more. Herzog + de Meuron’s creation renovates and old historic brick shipping warehouse with a larger structure covered in glass. The official ceremony kicked off earlier today for those involved with the project and some of citizens of Hamburg. The first musical event was an outdoor concert held on the Marco-Polo-Terrassen. On Saturday, May 29th, over 4,000 Hamburg residents will be able to visit the site and look in on the construction of the auditorium from the 8th floor while enjoying a completely new view of the city. The Elbphilharmonie is an attempt by Hamburg to bring about a cultural transformation for the city, and while it is not a spectacularly sustainable project, the new concert hall is an interesting synthesis of old and the new. Warehouse A is built on the site of the original Kaiserspeicher warehouse, a city landmark that was torn down after WWII. A new one was built in 1966 that stored coccoa, tea and tobacco until the early 1990s. For over a decade the warehouse sat empty, and now with the recent renovation and concert hall addition the prominent structure has been resurrected into a useful site for the city and the public. 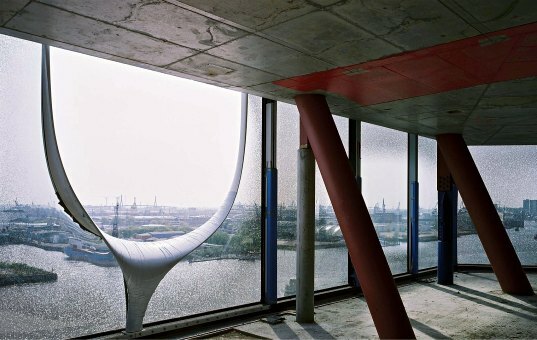 Today in Hamburg the "topping-out" celebrations began for the city's new cultural landmark on the Elbe River. Elbphilharmonie started construction a year and a half ago and is now reaching completion. The fantastical concert hall adds more than just an auditorium to the city, as the mixed-use complex also includes a hotel, restaurants, a conference center, condos, a public plaza, and more. Herzog + de Meuron's creation renovates and old historic brick shipping warehouse with a larger structure covered in glass.